Microscopes have been used with monochromatic illumination because achromatism in the ultraviolet has not been common. 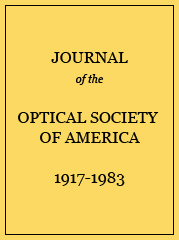 The authors have designed and made a few different objectives achromatized for a band width of about 100A in the region 2700A. These objectives make use of fused quartz and fluorite. They can be used in other regions of the ultraviolet spectrum, but require readjustment of focus.